Summary: The MSI GS65 has it where it counts in many ways. It looks a whole heck of a lot nicer than the previous MSI models, it gets a nice IPS 144 Hz screen with tiny bezels, a better keyboard and powerful hardware that actually performs well, with some tweaking. On the other hand, there are two big faults with the machine and that’s the build quality and the cooling system, which can be corrected to some extent. 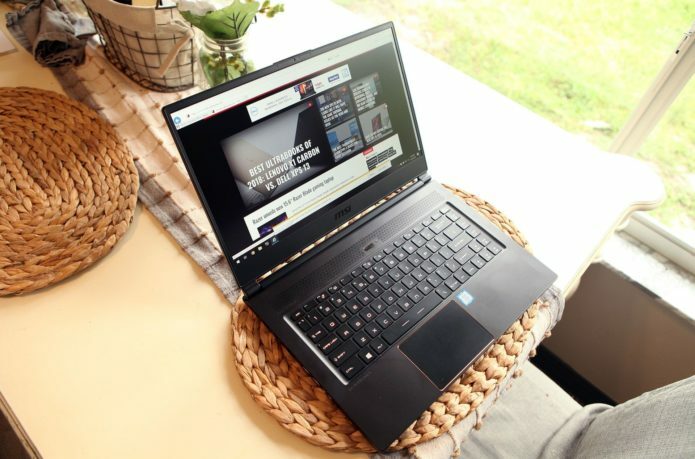 The GS60 was one of the first thin and light laptops that offered a high end mobile graphics card in it (the Nvidia 870m at the time). After another GPU generation and two CPU generations, they finally updated the body style to the GS63VR, which I also liked, but not as much as it’s bigger brother, the GS73VR. I thought they’d stick with that chassis for one more generation, but MSI changed things up a little more this time and it’s really perked my interest. Not only are they jamming the hexa-core processors into the same thin chassis, they are doing it in a near 14” form factor, with a 15” screen. There’s lots of other stuff that’s changed in the GS65, and after a couple weeks of owning one, I have a lot to say about it. I ended up picking up this machine from GentechPC, as they were offering a free repaste job, without voiding the warranty. After all the early reviews, I was really concerned with the throttling CPU temps, so I felt that a repaste right off the bat would be nice. Was it worth it? Well, yes, but there are some other things you can do to fix the thermals. If the GS65 isn’t for you, there’s a couple competitors out there. The Gigabyte Aero 15x is probably the closest, since it also has a very small footprint and pretty much has identical specs. The major cons are it’s a little more expensive, has the webcam under the screen and the design is a little more angular looking. But there are some pros too, such as a better build quality, better out of the box cooling and a numpad. I have heard that the keyboard is very cramped though and isn’t as easy to type on. The Zephyrus S GX531 is a newer model in the Zephyrus line, with a compact design, thin profile, modern hardware and 144 HZ screen. It’s available with either GTX 1060 or 1070 Max-Q graphics, just like the MSI GS65, but builds on the original Zephyrus, which means the keyboard/trackpad are oddly positioned and there’s only a small battery inside. Then there’s the new Razer Blade 15. They just updated their 14” model to include a 15.6” screen and the entire laptop pretty much has the same specs as the GS65. I haven’t seen many details on this one yet, but you could probably count on a better build construction with the unibody design. But unless their track record has changed, you might also be dealing with QC issues. With the same specs as this machine, the Razer Blade is $300 more as well.